Nima and Dylan discuss the sectoral balance equation and how it helps us explain Eurozone troubles. 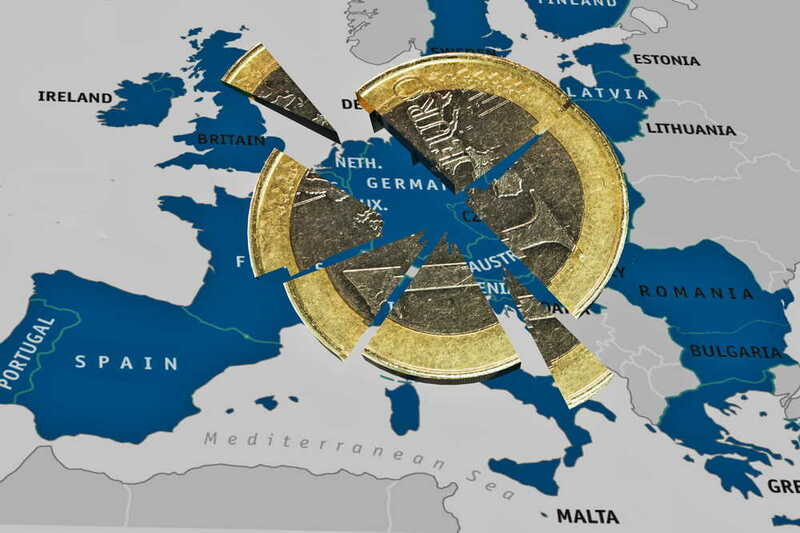 Author NimaPosted on September 5, 2018 Categories Global EconomicsTags euro, eurozone, mmt, modern monetary theory, sectoral balancesLeave a comment on Amagi Podcast @ Think Liberty – Episode03 – Sectoral Balances & Eurozone Madness! In a recent post I showed how the domestic private sector’s net saving can be a helpful economic indicator. When domestic private sector net saving runs low a recession may be on the horizon. When it goes negative a severe recession if not even a depression is in the cards. But what exactly is the domestic private sector’s net saving? It’s basically all cash, bank reserves, and government securities held in domestic accounts. In a fiat economy, as I’ve explained in my recent post about Modern Money Theory, the government is the sovereign issuer of high powered money. The government pays individuals by crediting their banks’ reserves, it taxes them by debiting the same. If more is injected than is drained over a certain period, a surplus remains in private bank accounts, while the government has incurred a budget deficit. Bank reserves can also be exchanged for government securities to earn some interest. Government securities essentially function like savings accounts at the Federal Reserve Bank. This leads us to the first way for the private sector to accumulate net savings which is is by receiving bank reserves (or cash) from the public sector. Note that in the example above I’ve left out the foreign (private and public) sector. It basically consists of individuals who possess and accept a different government’s fiat money but would like to trade with the domestic private sector here. If a foreigner wants to buy goods in the domestic private sector he sells his foreign currency ultimately to the domestic central bank (who then holds foreign currency reserves) in exchange for domestic currency, and then uses it to make his purchase. We can conclude that the domestic private sector can obtain additional net savings when it receives more inflows of money from abroad than it spends on purchases from abroad. This is commonly referred to as a current account surplus (the foreign sector’s deficit). A current account deficit (foreign surplus) has the opposite effect: It drains the domestic private sector’s net savings. But ultimately if you trace it back all the way a current account surplus is of course also the result of some other government having spent more than it has taxed. It is true that domestic banks also make loans which create new domestic checking accounts, essentially somebody’s savings. However, this type of creation of new savings is always counterbalanced by a loan, so it nets out to zero within the domestic economy. No net financial assets are created for the domestic private sector here. We have now established 3 different sectors that play an important role in a fiat money economy: The public sector (the issuer of the national currency and unit of account), the private sector (the user of the national currency), and the foreign sector (issuer or user of a different currency). It should be clear from this that the separation into these 3 sectors is by no means arbitrary. It is based on the actors’ relation to the national currency. It should also be clear from my outline above that the net balances of each of these sectors add up to zero. For example: If the country has balanced trade and the current account is at 0, the public sector’s budget deficit matches to the cent the mirror image of the domestic private sector’s net accumulation of financial assets, aka the net private saving in the country. You can see there that the private sector’s surplus (blue) plus the foreign sector’s surplus (green) consistently equal the inverse government budget deficit (red) to the cent. You may have noticed that the private sector surplus in the blue chart above is exactly the same chart as the one I presented a few weeks ago when I explained the correlation between private sector saving and recessions. What do we conclude from this? 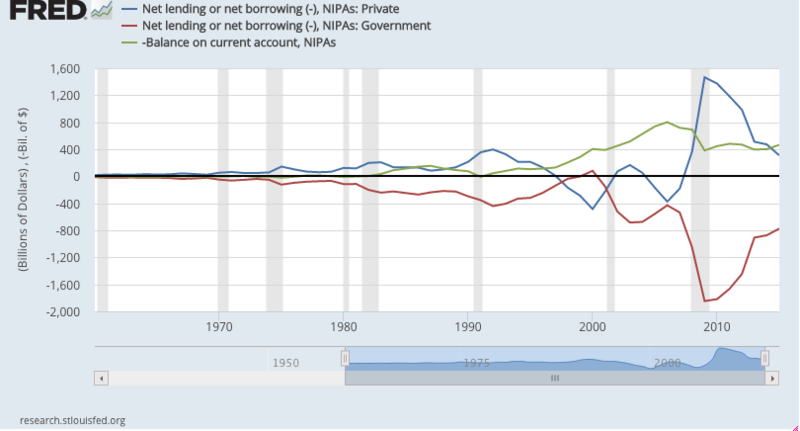 In order to achieve a sustained level of net private saving, which seems to be important to the health of the domestic economy in a fiat money system, a country either needs to run a sustained current account surplus, or a government budget deficit, or a mix of both. In the case of the United States, which runs a current account deficit at the moment, there is in fact no other way to accumulate net private savings than to run a government budget deficit. This is an important mathematical identity to keep in mind when listening to public policy debates and discussions about the budget deficit and so called “balanced budgets”. Given that under a fiat regime the domestic private sector of any country has an inherent demand for net private savings, and given that under such a regime the government is by law the only supplier (monopoly supplier) of such net private savings, it is important to keep in mind that making a “balanced budget” your domestic policy objective runs the risk of depriving the private sector of that which it demands. If all governments in the world were to run “balanced budgets” there would in fact be no way at all to accommodate any territory’s private sector demand for net savings on top of making the required tax payments. None of what has been presented so far is a political prescription, as much as it is just basic math. This information can be utilized by people who favor big government or small government alike. Budget deficits to accommodate private sector savings demands in a fiat money system can be achieved by means of increasing government spending, but they can also be achieved by cutting taxes, the latter obviously being the preferred policy of choice for many libertarians, myself included. RED ALERT: US 2017 Q4 Net Private Saving Crashes to Disastrous Levels; Huge Recession Suddenly In The Cards! Is Austerity a “Recipe for Disaster”?